We’ve now experienced the Greek Island of Santorini. Lovely days full of sun (very hot! ), a luxurious Starwood property and amazing sites are recapped below. Scroll down for photos and panorama’s. 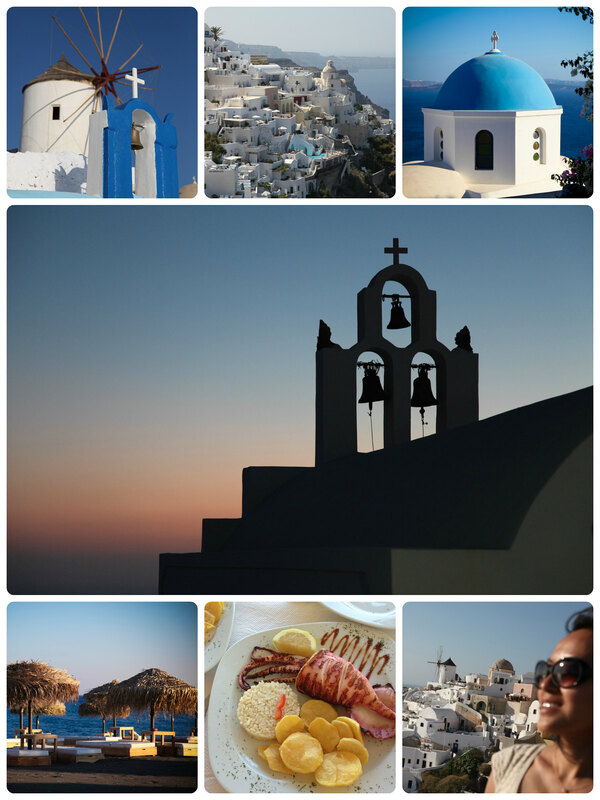 Santorini was one stop along our summer of European holiday with just Ningning and myself. After Santorini, we traveled to Athens. Our resort of choice was the Vedema, a Starwood luxury collection property. Set in the quiet village of Megalochori, Vedema offers a peaceful surrounding, Aegean ocean views, a lovely town, and quick rides (complimentary) to either Fira or Perissa beach are all here. Breakfast was a large spread with many traditional items. Very yummy and as Plat it was comped. Additionally, we got hooked on Greek Freddo cappuccinos! We considered Mystique in Oia but settled on Vedema. (When in Oia we walked around Mystigue and confirmed we picked correctly. Mystigue wasn’t as prestigious or private as we thought it would be. Most rooms opened onto pathways that other guests would use; the infinity pool was on the small side and you needed to climb what felt like 50 steps to enter or exit. Of course, the benefit is that you are in Oia.) We were in two rooms over our Vedema stay. First, they gave us a Dorian Suite, Theta7. Staff told us that our roof-top terrace had the best view – a 360 degree view. Right they were. Was great at night to see the village lit-up and to see the Aegean by day. Regrettably, the sun was blistering during the day and the terrace wasn’t a place to be. The last night we were upgraded into an Olympian villa. Spectacular best describes the spacious living area complete with kitchenette/Nespresso machine, huge walk in closet, bed looking out to the Aegean sea, bath with separate Jacuzzi tub+shower & shower and private swimming pool with outdoor jacuzzi! Room K2 was a lovely experience. Both rooms had a complimentary bottle of Santo white wine and fruit waiting upon arrival. Internet access was slow. Don’t expect to do Skype or FaceTime calls at Vedema. Our island dinners almost always consisted of seafood. The first night we went to the black beach/Perissa beach (South coast) and ate at Atlantis Island restaurant. Ningning had a huge piece of grilled squid and I ate their fish of the day, mackerel. Both were tasty – and accompanied with our first true Greek salad and Greek panacota. The second night found us north in Oia. The day had been long and we wanted a comfortable place to watch the sunset. We opted for restaurant 218 which didn’t have the idealistic sunset view (those tables like at Kerpos were long booked up) but still jutted out over the sea and offered a good view south of Oia town, the Islands, Fira, and north to where the sun gradually set. Our meals were very good (Mussaka but with noodles, squid risotto and meat in vine leaves and tomatoes) and we recommend the food and location. Acropolis on the black beach was yet another favorite. We had the two-person fish platter. We got stuffed eating the squid, two types of fish, mussels and side dishes of salad, chips and rice. Oia (pronounced EE–ah) and Fira are bustling tourist towns built into the side of the volcanic created island. It’s a site to see, for sure. We enjoyed the walk along the Fira coastline (the shops inland are touristy and cheesy) and especially the walk north from Fira towards Oia. We made it only up to Imerovigli – but lovely to walk. Get north and elevated and you can see both Fira and Oia. The iconic blue domed churches dot the landscape amidst hotels, restaurants and shops. We took the bus from Fira to Oia (very cheap for the distance). The road is windy and sometimes impassible for 2 vehicles side by side. Off to the east you see barren island down around sea level. To the west you can see the Oia/Fira town scapes. If driving, watch out for the quads and scooters as they are everywhere. In Oia, we walked all the way north to the castle ruins and around to the east. The sun beating off the marble pathway made it super hot. The black beach (Perissa) became a favorite for us. The Vedema has an alliance with the Black Rose bar to use their loungers and umbrellas. We just lounged a bit while eating, resting, sleeping or swimming in the ocean.